I imagine a team of mutant beakless chickens called…. and his sidekick, the Human Candle! is he naked under there? or does he wear some sort of invisible underwear? if so… how will he wash them? how does he know if they’re dirty? and what about shoes? does he go barefoot all the time? even in the snow? sounds like a pretty inconvienient special power. Um…. if he has INVISIBLE feet how could you tell whether he’s hovering or not….? Is it when he’s like 50 feet taller than all of the other chickens? But how do we know that he just isn’t really tall????? That’s like my superpower! The ability to fall, hurt myself and not spill my coffee. I should be on this team too! Mmmm…drumsticks for the invisible man. Reminds me of Invisible Boy from the movie “Mystery Men”, where he could only turn invisible when no one is watching. This IS a useful power. You know the monster that hides under your bed (or did when you were 8) and would grab your legs if you got out? 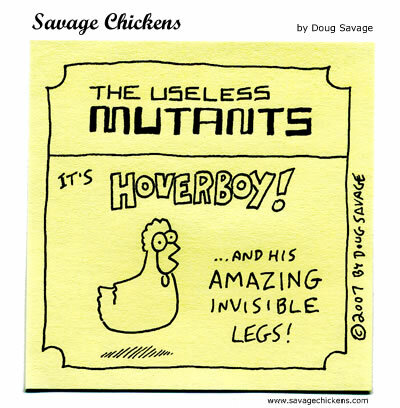 Well, Hoverboy is immune from that monster – he could just hover to the toilet! Why does “random” always lead to this one?